A great man is different from an eminent one in that he is ready to be servant of the society. 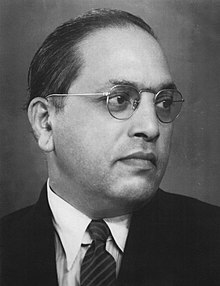 Bhimrao Ramji Ambedkar (April 14, 1891 – December 6, 1956), commonly known as Dr. Babasaheb Ambedkar (Marathi: बाबासाहेब Babasaheb "Respected Father"). He was an Indian polymath: jurist, economist, politician, philosopher, anthropologist, sociologist, educationist, editor, journalist, historian and writer. He pioneered revival of Buddhism in India and inspired the modern Buddhist movement. He was the champion of human rights, independent India's first law minister, the architect of the Constitution of India and founding father of republic India. My final words of advice to you are educate, agitate and organize; have faith in yourself. With justice on our side I do not see how we can lose our battle. The battle to me is a matter of joy. The battle is in the fullest sense spiritual. There is nothing material or social in it. For ours is a battle not for wealth or for power. It is a battle for freedom. The greatest thing the Buddha has done is to tell the world that the world cannot be reformed except by the reformation of the mind of man and the mind of the world. Every progress has its bill of costs and only those who pay for it will have that progress. I was born a Hindu but will not die one. I prefer Buddhism because it gives three principles in combination, which no other religion does. Buddhism teaches prajna (understanding as against superstition and supernaturalism), karuna (love), and samara (equality). This is what man wants for a good and happy life. Neither god nor soul can save society. Caste is not just a division of labour, it is a division of labourers. The Brahmin of Panjab is racially of the same stock as the Chamar of Punjab". ... "Caste system does not demarcate racial division. Caste system is a social division of people of the same race. Annihilation of Caste. See p.49 of his Writings and Speeches, vol.1, Education Dpt., Government of Maharashtra 1979. Quoted from Elst, Koenraad (1991). Ayodhya and after: Issues before Hindu society. The Mussalman invaders sacked the Buddhist universities of Nalanda, Vikramshila, Jagaddala, Odantapuri to name only a few. They raised to the ground Buddhist monasteries with which the country was studded. The monks fled away in thousands to Nepal, Tibet and other places outside India. A very large number were killed outright by the Muslim commanders. How the Buddhist priesthood perished by the sword of the Muslim invaders has been recorded by the Muslim historians themselves. Summarizing the evidence relating to the slaughter of the Buddhist Monks perpetrated by the Musalman General in the course of his invasion of Bihar in 1197 AD, Mr. Vincent Smith says, "....Great quantities of plunder were obtained, and the slaughter of the 'shaven headed Brahmans', that is to say the Buddhist monks, was so thoroughly completed, that when the victor sought for someone capable of explaining the contents of the books in the libraries of the monasteries, not a living man could be found who was able to read them. 'It was discovered,' we are told, 'that the whole of that fortress and city was a college, and in the Hindi tongue they call a college Bihar.' " Such was the slaughter of the Buddhist priesthood perpetrated by the Islamic invaders. The axe was struck at the very root. For by killing the Buddhist priesthood, Islam killed Buddhism. This was the greatest disaster that befell the religion of the Buddha in India. The third thing that is noticeable is the adoption by the Muslims of the gangster's method in politics. The riots are a sufficient indication that gangsterism has become a settled part of their strategy in politics. They seem to be consciously and deliberately imitating the Sudeten Germans in the means employed by them against the Czechs. So long as the Muslims were the aggressors, the Hindus were passive, and in the conflict they suffered more than the Muslims did. But this is no longer true. The Hindus have learned to retaliate and no longer feel any compunction in knifing a Musalman. This spirit of retaliation bids fair to produce the ugly spectacle of gangsterism against gangsterism. N.D. Arora. Political Science for Civil Services Main Examination. Tata McGraw-Hill Education. p. 1–25. ISBN 978-0-07-009094-1. Every man who repeats the dogma of Mill that one country is not fit to rule another country must admit that a class is not fit to rule another class. For a successful revolution, it is not enough that there is enough discontent. What is required is a profound and thorough conviction of justice, necessity and importance of political and social rights. History shows that where ethics and economics come in conflict, victory is always with economics. Vs vested interests have never been be known to have willingly divested themselves unless there was sufficient force to compel them. In Hinduism, conscience, reason, and independent thinking have no scope for development. Indians today are governed by different ideologies. Their political ideal set in the Preamble of the Constitution affirms a life of liberty, equality and fraternity. Their social ideal embodied in their religion denies them. I was born a Hindu because I had no control over this, but I shall not die a Hindu. It was not enough that India should get Swaraj. It was more important in whose hands the Swaraj would be. Freedom of mind is the real freedom. A person whose mind is not free though he may not be in chains, is a slave, not a free man. One whose mind is not free, though he may not be in prison, is a prisoner and not a free man. One whose mind is not free though alive, is no better than dead. Freedom of mind is the proof of one's existence. Unlike a drop of water which loses its identity when it joins the ocean, man does not lose his being in the society in which he lives. Man's life is independent. He is born not for the development of the society alone, but for the development of his self too. Equality may be a fiction but nonetheless one must accept it as governing principle. Majorities are of two sorts: (1) Communal majority and (ii) political majority. A political majority is changeable in its class composition. A political majority grows. A communal majority is born.The admission to a political majority is open. The door in a communal majority is closed. The politics of political majority are free to all to make and unmake. The politics of community majority are made by its own members born in it. I have met Doctor Ambedkar. He was one of the intelligent men I have ever met. Ambedkar stands as the fountainhead of wisdom and knowledge in modern India. But though Bhimrao Ramji Ambedkar had been a Buddhist for only seven weeks, during that period he had probably done more for the promotion of Buddhism than any other Indian since Ashoka. At the time of this death three quarters of a million Untouchables had become Buddhists, and in the months that followed hundreds of thousands more took the same step – despite the uncertainty and confusion that had been created by the sudden loss of their great leader… This was Ambedkar’s last and greatest achievement, so that even though it was as the Architect of the Constitution of Free India and the Modern Manu that he passed into official history and is today most widely remembered, his real significance consists in the fact that it was he who established a revived Indian Buddhism on a firm foundation. Dr. Ambedkar, the creator of Indian Constitution, spread awareness about the religion in 1956. Today, we need to understand the real meaning of Buddha, Buddhism. At Sangh Parivar functions, a picture of Ambedkar is mostly displayed along with pictures of Maharana Pratap, Shivaji, Guru Govind Singh, Hedgewar, Golwalkar and other more obvious Hindutva heroes. During BJP President L.K. Advani's flopped Rath Yatra (car procession) before the 1996 Lok Sabha elections, his car carried just two pictures: of freedom fighter Subhash Chandra Bose and of Dr. Ambedkar. Ambedkar took a cool and hard look at Islam as a sworn enemy of Hindu society, even while being bitterly critical of the latter. Dr. Ambedkar was particularly outspoken about the social injustices in Islam, especially in his book Pakistan or the Partition of India (1940). According to his biographer Dhananjay Keer, “some penetrating and caustic paragraphs were deleted, it is said, at the instance of Ambedkar’s close admirers” for the sake of his own safety; but what remains is still quite radical. Dr. Ambedkar also rejected Islam because it had destroyed Buddhism in India and other countries... But Dr. Ambedkar has also written: “There can be no doubt that the fall of Buddhism was due to the invasions of the Muslims.”... Many of Dr. Ambedkar’s observations on Islam would now be branded as “Hindu communalist” by the very people who claim his heritage. in fact, the literature of the RSS Parivar offers no counterpart to Ambedkar’s strong language about Islam: he was more openly anti-Islamic than Savarkar, Golwalkar or any Hindutva stalwart who is regularly accused of being just that. From the Hindu Revivalist point of view, Ambedkar, in writing his incisive criticism of Islam, did the homework which the Hindutva ideologues neglected. We believe that the future is what we make it. We believe that no matter who you are or where you come from, every person can fulfill their God-given potential. Just as a Dalit like Dr. Ambedkar could lift himself up and pen the words of the constitution that protects the rights of all Indians. We believe that no matter where you live – whether a village in Punjab or the by lanes of Chandni Chowk, an old section of Kolkata or a new high-rise in Bangalore – every person deserves the same chance to live in security and dignity, to get an education, to find work, and to give their children a better future. There was one portrait. And interestingly, it was not of the leader of the Shiv Sena or of Shivaji, the Sena's warrior god, but of the long-dead Dr. Ambedkar (...) Popular-and near-ecstatic-movements like the Shiv Sena ritualize many different needs. The Sena here, honouring an angry and (for all his eminence) defeated man, seemed quite different from the Sena the newspapers wrote about. V.S. Naipaul: A Wounded Civilization, p.65., writing about a Shiv Sena centre in Mumbai. Dr. Babasaheb Ambedkar was fearless. He propogated love and humanity. He loved people and gave them a thought of humanity. Babasaheb never gave up he was fearless. So today I have had difficulties, problems or situation is bad I remember Babasaheb. That's why I get inspiration from him. That's why Babasaheb is my role model"
Aamir Khan, Aamir Khan considered Dr. Babasaheb Ambedkar is his inspiration. Ambedkar is my Father in Economics. He is true celebrated champion of the underprivileged. He deserves more than what he has achieved today. However he was highly controversial figure in his home country, though it was not the reality. His contribution in the field of economics is marvelous and will be remembered forever..! Amartya Sen, "Dr. BR Ambedkar: As an Economist." International Journal of Humanities and Social Science Invention 2.3 (2013): 24-27. Dr. Ambedkar never got disappointed with difficult tasks, but faced the situation with great courage. I am especially appealing to the younger generation of students to take a leaf out of Dr. Ambedkar's life. At difficult times, his life can be a great inspiration.... [Ambedkar] came to the RSS camp in Pune and appreciated its patriotism, discipline and complete absence of untouchability. But he said he was in a hurry and Sangh work appears to be a little slow.... We salute the Architect of our Constitution, his erudition and hard work, his great patriotism and practical outlook. But it was natural that he could not stomach the indignities heaped on the Dalits and the attitude of our upper castes in the Hindu society appeared to change too slowly. Let us take a vow on this occasion to make the Hindu society free from aberrations, a society full of harmony, self-confidence and knowledge, so that it can carry the message of the great Rishis to the whole world. This page was last edited on 21 April 2019, at 12:41.